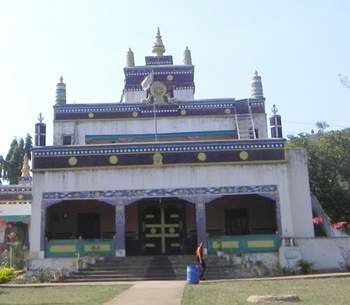 Duddul Raptenling is a Nyingma monastery founded by Dudjom Rinpoche in Orissa, India. The construction began in 1961, close to Camp no.3, in Orissa Tibetan Refuge settlement, after the Dalai Lama’s requested Dudjom Rinpoche to build monasteries to help preserve the Nyingma lineage. Dudjom Rinpoche named the monastery Duddul Raptenling and chose Chagdud Tulku Rinpoche as the first heard of the monastery. Around 1969, under the supervision of Lama Sherap Dorje Rinpoche and Lama Donam, a two-storey tsuklakhang construction was launched, but due to a lack of resources, it took another 10 years to complete. Around 1978, with the help of the Tibetan representative, Tulku Tsephel, Duddul Raptenling Monastery was completed. In February 1979, the Dalai Lama consecrated and inaugurated Duddul Raptenling. In 1997, Shenphen Dawa Rinpoche visited Duddul Raptenling. This page was last edited on 9 February 2018, at 08:54.